We spent two weeks in one of the apartments and has been a great joy. Comfort, tranquility, lovely surroundings and above all we must stress the treatment we gave Elena, its owner. We could go into endless details, but it really worth it to go and see for yourself. The village is a charm, and around wonderful. The range of possibilities when it comes out is immense; picturesque villages, natural pools, contact with nature, cultural tours and much more. But we insist that all this has been possible thanks to Elena, He has given us an exquisite and thereby made us feel at home. Thank you very much for making our summer holidays have been an unforgettable experience. We have spent three days in this apartment and the experience has been very good, are great and not lacking details we were with a girl 18 months and perfect the beautiful apartment , pool and garden loved, emphasize the friendliness of the owner truth is a charm, hope to repeat. It is a place to rest becomes easy,surrounded by greenery and with fabulous views of the mountains. Has heated pool 24 hours over many months a year,the water is perfect even make a bad day, and if you want to swim at night possible, our son really enjoy it. The owner, Elena, is a nicer always ready to make our stay lovely woman. The location is good as there are many areas to visit nearby how Plasencia, Hervas,the Hurd etc.sin definitely a good place to spend a few days surrounded by peace and harmony with rural life. It's beautiful, is entering the apartment and think it's a dream, is beautiful, cozy and heated pool best. We spent the weekend at these apartments and have returned delighted. Ideal to relax and enjoy the beautiful view from the porch. 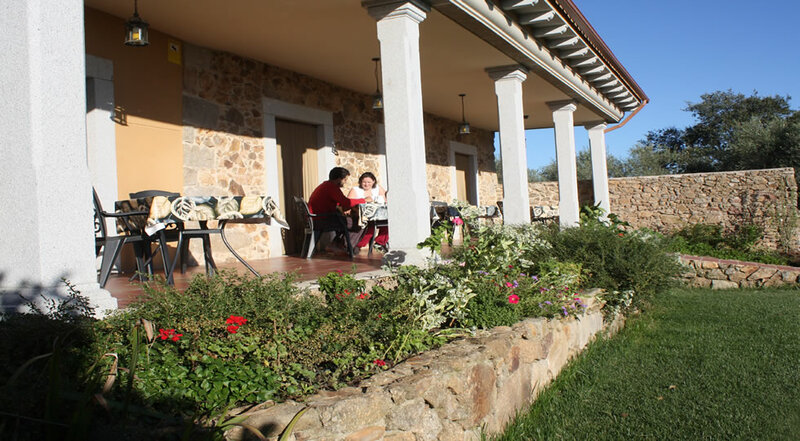 They are decorated with great taste, with an architecture that recreates the Roman Villae. The garden well maintained and we were sorry for not able to enjoy the pool. Be back soon! The owner is friendly and attentive. The place is very quiet, the village has character, Granadilla wonderful and the pasture was spring. Nice, comfortable apartment. In a quiet little village, The garden was pleasant and my wife enjoyed the swimming pool. The owner is a nice lady, very helpfull with documents and maps from the region. We spent a week doing very rewarding tours, with the particularity that upon returning to our accommodation was waiting for the pool house to take away the heat and dust of the road. Would repeat and maybe we. Thanks Elena for your attention.